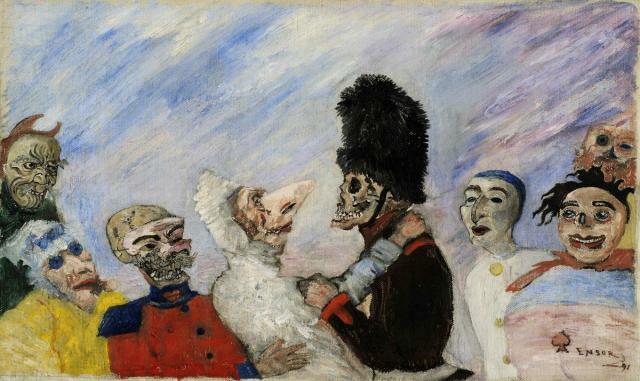 Recently, an unknown painting by James Ensor from 1891 was discovered with the title Squelette arrêtant masques (Skeleton Arresting Masqueraders). The work is painted with oil paints on canvas. It measures 33 by 55 cm and is signed and dated on the lower left as: ENSOR/1891. The painting is mentioned in the list of works published in the monograph of Emile Verhaeren (1908), as well as in the monograph by Grégoire Le Roy (1922). (1) As far as I know, the work was never exhibited. It also remains unmentioned in Ensor's letters. In Skeleton Arresting Masqueraders, a masked personage is presented that is apprehended by two skeletons. The masked personage is wearing a white garment with a pleated bonnet, probably a sleeping gown, and a carnival mask with a large nose. The masked woman appears to be defending herself against a police office with a black busby headgear. Behind her stands another skeleton in a red coat with blue epaulettes, collar and buttons. On his blue collar is a prominent red ace of hearts. It is a soldier or a member of a musical band. He appears to being capturing or holding back the masked personage. (2) It is worthy of note that he is only wearing half of a mask, which contributes to the macabre aspect of the whole presentation. With Ensor, we principally see skeletons and masks, but a skeleton that is wearing a mask is something not seen before. On the far left we see a mask from Japanese No drama. Most likely it is a mask that represents Oni (an evil-natured spirit or divinity) or Hannya (a vengeful female demon). Below the Japanese mask, on the left, there is a carnival mask (white hat and glasses) that we find in other Ensors, amongst which is Scandalized Masks from 1883 (Royal Museums of Fine Arts of Belgium, Brussels) [Tricot 247]. To the right of the police officer are three masked figures. The Pierrot figure is immediately recognisable. To the right of him stands a corpulent person with a carnival mask. A red ace of spades is painted on his belly. Above right we see a third masked person of whom the contours are not totally clear. We find various masks again, both left and right, in the painting Skeletons Fighting for the Body of a Hanged Man from 1891 (KMSKA, Antwerp) [Tricot 334]. The gruesome scene occurs in an attic room where two costumed skeletons are fighting with bristled brooms. The impetus for the fight is the body of a hanged man. On his neck hangs a board with the citation CIVET (jugged hare). The attitude of the two skeletons is in concordance with the two protagonists in the foreground of the painting by Pieter Bruegel I, The Battle Between Carnival and Lent (Kunsthistorisches Museum, Vienna) from 1559. Just as with the allegorical presentation in Bruegel's work, Ensor's painting has multiple interpretations. One asks how the man came to his demise. Who has hanged him, or did he hang himself? Is the hanged man a cryptic alter ego of the painter that falls prey to enmity of the art critics? In another work from the same year, Ecce Homo [Tricot 330], we recognise James Ensor as Christ, flanked by the Belgian art critics Édouard Fétis (1812 - 1909) and Max Sulzberger (1830 - 1901), presented as executioners. In Skeletons Fighting for the Body of a Hanged Man, it is clear that the two clothed skeletons are laying claim to the body at all costs. One of the hungry masqueraders in the doorway even holds a knife in attack mode and is ready to enjoy the festivities. As in Skeletons Fighting for the Body of a Hanged Man, in Skeleton Arresting Masqueraders there is a violent scene that transcends the mere carnivalesque. How should we interpret this scene? Is it an allegory? Is Ensor referring to an event from 1891? At first glance it deals with a scene during the carnival festivities whereby masked night-time revellers or troublemakers are being arrested by a police officer. Is Ensor here maybe presenting himself as a masked personage that is being arrested by a police officer and a soldier? Or, is the police officer Ensor himself? Ensor presents himself as a skeleton in his etching My Portrait as a Skeleton [Taevernier 67] from 1888 and in the oil painting Skeleton Painter in his Studio from 1896/97 (KMSKA) [Tricot 385]. In two small paintings from 1891, Baptism of Masqueraders [Tricot 340] and Masquerade [Tricot 341], he presents himself as a police officer. Baptism of Masqueraders is incidentally based upon a photo in which Ensor, along with members of the Rousseau family, is amusing himself during a costume party. Ensor's aversion of the established order and repression is here in any case underlined by depicting the police officer and the soldier as skeletons. Numerous other works, including The Gendarmes (1892) [Tricot] or the refined drawing The Strike (1888), blatantly present the violence of the upholders of order. In the Almanach de l'Université de Bruxelles (Almanac of the Free University of Brussels) from 1891, a report is made of a turbulent meeting of professors and students on the occasion of the contested appointment of Georges Dwelshauvers (1886-1937) as a professor at the ULB. His doctoral thesis, which was a consequence of his studies carried out in Germany, was, however, refused by Professor Guillaume Tiberghien (1819-1901), who held the philosophy faculty in a strong, conservative grip and rejected experimental psychology. This led to the first major student uprising at the ULB. The police had to intervene and the Rector resigned. (3) James Ensor frequented the Brussels cabaret Le Diable-au-Corps and must therefore have been in regular contact with these Brussels students who gave luster to their meetings with lots of 'zwanze' (typical Brussels humour). This event is known as the ‘Dwelshauvers affair' and was one of the reasons for a division within the ULB and the establishment of the Université Nouvelle. Whether Ensor is making an allusion to the skirmish during this incident is naturally difficult to confirm. James Ensor was very up to date on what played out in the political and cultural centres of Brussels. During the years of 1880 - 1890, he regularly stayed in the capital city and was a guest at the house of Dr Ernest Rousseau, Professor and for a few years Rector of the ULB. During these years he also had sympathy for the anarchist and socialist ideas that were common at the time. In 1890, he etches the portrait of Professor Hector Denis (1842 - 193) [Taevernier 82], who, from 1892 to 1894, was the Rector of the ULB. In 1892, Ensor paints The Bad Doctors [Tricot 346], the satirical, or rather sarcastic, painting with a few professors from the ULB as the protagonists. The same year he paints Mr and Mrs Rousseau in Conversation with Sophie Yoteko [Tricot 355], in which Sofia Ioteyko (born in Kiev in 1868) is comically portrayed in the company of Dr Ernest Rousseau and Mariette Rousseau-Hannon. (4) Incidentally, Sofia Ioteyko and Georges Dwelshauvers were both named in the Almanach de l'Université Libre de Bruxelles from 1891. Another work in which Ensor undoubtedly alludes to pantomime is The Despair of Pierrot [Tricot 357], in which the son of Ernest Rousseau plays the role of Pierrot. In this work, Ensor perhaps alludes to the pantomime Pierrot macabre (1886) by his friend, the painter and writer Théo Hannon (1851 - 1916), brother of Mrs Mariette Rousseau. (1) Émile Verhaeren, James Ensor, G. Van Oest, Brussels, 1908, p. 117; Grégoire Le Roy, James Ensor, G. Van Oest, Brussels & Paris, 1922, p. 183. (2) Red jackets were primarily worn by British soldiers, but also by musicians in Belgian fanfares and by certain circus figures. Almanach de l'Université Libre de Bruxelles, 1891, pp. 9-10. (4) With regards to the meaning of the name ‘Sophie Yoteko' (also spelled Ioteiko), see: Patrick Florizoone in the exhibition catalogue James Ensor, Frankfurt, Schirn Kunsthalle, 2005-2006, p. 222. Also see the letter from 19 November 1890 from August Vermeylen to Emmanuel De Bom [see website CTB, AMVC Letterenhuis: VNS.WVNS.1890.1119B106]. It is possible that Ensor also is referring to the comical Kagura mask Yottoko (or Hyottoko) that was used in the Japanese Dengaku dance theatre. This character type functions as the fool. Perhaps the name Sophie also refers to the official first name of Mariette Rousseau: Marie-Sophie. In this case, Sophie Yoteko could be an alter ego of Mariette Rousseau and the young woman to the right regards her likeness as an old woman. Moreover, we recognise in the face of the old woman, to the left of the composition, features of the painter himself, which naturally makes the interpretation even more complex. James Ensor. Peintre & graveur, Librairie de la Société anonyme ‘La Plume', Paris, 1899, p. 51. (6) See the Online Publication Gilles and Sauvage.